Many people who follow stock markets may have noticed charts. These are graphical representation of price volume data over a period of time. It could be price plotted every hour, day, week or month and are known as hourly, daily, weekly or monthly charts respectively. These charts are very important since the stock’s demand versus supply can be ascertained from the price action. Volume is also displayed on the charts. A visual examination of the chart will reveal how the stock moved within a particular period (day, week etc.). 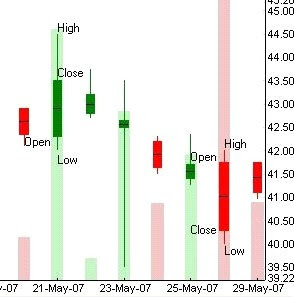 As we can see, the ‘candlesticks’ are more visually appealing compared to the OHLC bar charts. As co-movement of price and volume gets plotted over a time, the current market status can be examined easily. In a bull market, increasing volume with increasing prices during an uptrend indicates bullishness. During a corrective decline in a bull market, we can see declining volumes with declining prices. In a bear market, increase in volume with decreasing prices can be spotted. During pullbacks in bear markets, declining volumes with increasing prices can be seen. Though volumes may not increase uniformly all the time, a trend can be observed. These are certain types of formations in charts which indicate bullishness or bearishness. These are formed by support / resistance levels and trendlines. Support level is the price where buyers will enter the stock and take control over the sellers. Resistance level is the price above which the stock must trade in order to move up higher. Bullish patterns: Double bottom, triple bottom, inverse head and shoulder pattern, cup and handle breakout, triangle breakout etc. 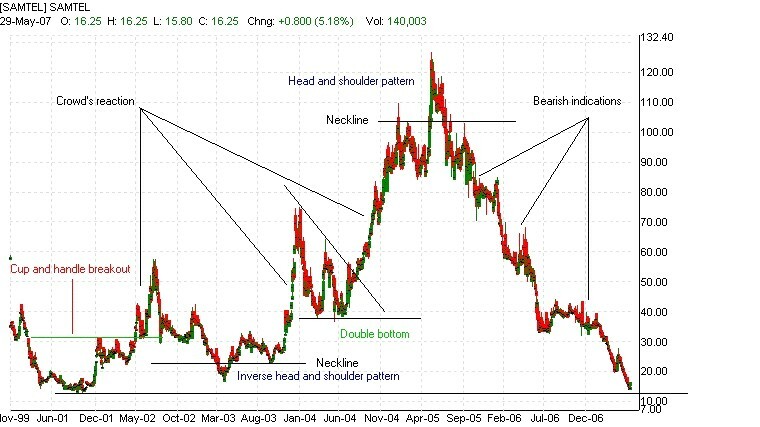 Bearish patterns: Double top, triple top, head and shoulder pattern etc. The daily chart of SAMTEL is shown below. Let us analyze how many chart patterns have been formed over a period of time. This is an interesting stock since this gives an idea as to how the market reacts quickly to a chart formation. 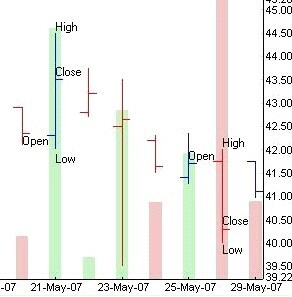 Bewteen March 2001 and April 2002 watch the ‘cup’ shaped price movement followed by the ‘handle’. Watch the resistance could not be broken on the first attempt. That lead to another decline. Eventually, after the resistance at 31.50 was broken, the stock touched a high of 57.50. It can easily be noted that the green line or the ‘top’ of cup was a strong support during the corrective decline from 42.90 to 30.90. This bullish pattern was formed between August 2002 and November 2003. It simply looks like an inverted man. Please note that the ‘shoulders’ may not be horizontally on the same line and this is nothing unusual. After the resistance around 32.80 was broken, see how quickly the prices were flying vertically upto 74.65. This was again followed by a corrective decline. This pattern was formed around the 38.35 which was the next resistance when the stock bounced back during the inverse head and shoulder pattern. Again, after the resistance trendline was broken, we can see the heavy buying upto 124.70. Double bottoms and triple bottoms are usually more reliable bullish patterns, indicating strong support levels. After hitting a high of 124.70, stock fell to 84.20 and after the reversal, it was unable to pierce the ‘neckline’ as can be seen in the chart. The neckline is an important resistance zone in this pattern. Ever since this happened, stock has been terribly bearish. All supports have been broken, except for the last one at around 12.70. This is almost 1/10th of its high price. Just imagine a person who bought it near the high price and wondering what’s going on with this. Currently it is 16.25. As can be seen from the chart, the bullish and bearish patterns, when spotted successfully, foretell how the stock will perform in the near future. 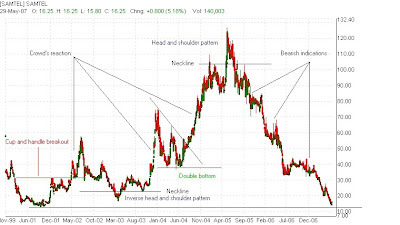 In this case, the head and shoulder pattern has clearly indicated the bearishness and stock was hit very badly. What will happen to this stock in the near future? As mentioned earlier, it just managed to bounce back near its last horizontal support around 12.70 but without much volume. Momentum indicators are negative and if it is able to sustain above the support of 12.70, we can expect a consolidation phase. But consolidation phase may last for longer durations, and as such, there is nothing this stock can offer for anyone for the time being. When investors make a decision to buy a stock for long term investments, it is better to observe patterns such as these. That will help them to hold stocks for better returns.